This year our students have entered more science competitions than ever before, one of which, the Victorian Titration Competition, was for the first time. Out of a total of 322 schools, the top 35 go through to the final. We came 20th and beat some very prestigious schools to go through to the finals. Our final results were a silver award for both Mukul Cho-dhary and Jessy Tsai and we came third in the state. A fantastic result. 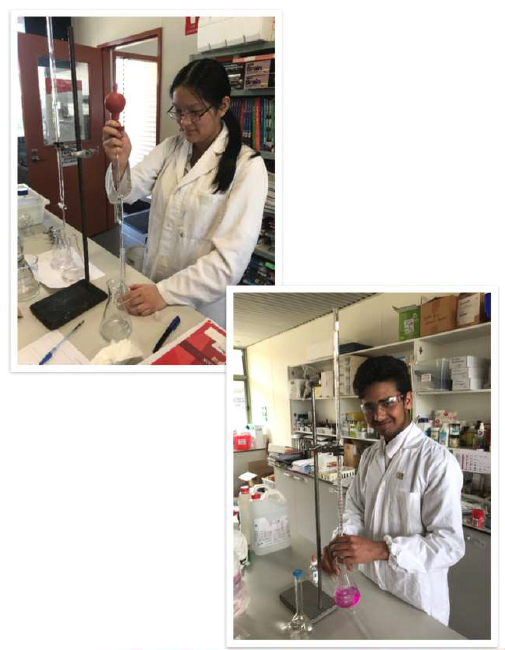 Many thanks to Dr Zamurs and Sheree Baker (our laboratory technician) for all their help in teaching Mukul and Jessy their impressive titration techniques and for time to practice and hone these skills. Jessy and Mukul also decided that they wanted to enter the Australian Science Olympiad Competition for Physics and Chemistry. This involves sitting a two- hour exam for each subject so as to compete with other students from all over Australia. We are very pleased to award Mukul a Participation certificate for Physics and a Credit certificate for Chemistry. Jessy received a Participation certificate for Chemistry and won a High Distinction for Physics, which means that she is in the top 10% of students competing for Physics in Australia. On behalf of all the Science staff, we would like to congratulate all of the students who have competed and succeeded in these competitions. As a school, we are all very proud of their achievements and look forward to more in the future as we still have the final of the 3D Print a Car Challenge to complete. If you would like to enter any science competitions in the future, please don’t hesitate to see Mrs. Kammerhofer and she will try and make it happen.